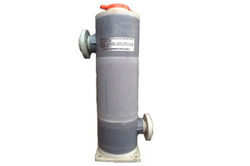 We are a leading Manufacturer of priming chamber from Ahmedabad, India. Horizontal Pumps can be fitted with a Priming Chamber to provide self priming capabilities. Priming Chambers are Injection Moulded Polypropylene. Priming Chamber is like a Tank which maintains Positive Head on the Pump. In case of Suction Lift applications, the Pump alone does not generate enough vacuum so that Pumping Liquid will rise from the Sump to the Pump Suction. Hence, a Priming Chamber is used which generates enough vacuum so that the Pumping Liquid rises and enters the Priming Chamber thus maintaining Positive Head on the Pump. Initially, for the first time, when the Pump is started, the Priming Chamber and the Suction Pipe must be Primed ( filled with Water ) this means that there is liquid in the Suction Pipe. Running of the Pump creates a vacuum thus, creating a volume deficit and the Liquid gets sucked in the Priming Chamber ensuring Liquid supply to the Pump. It is recommended that an NRV be installed in the Suction Line before the Priming Chamber so that the Volume contained in the Priming Chamber does not flow back to the Sump. Above all, a charge of Liquid necessary to prime the Pump is retained in the Priming Chamber.